Devon Drohan's Earth Day Essay on sustainable living and the advantages of creating a bike trail system in Westborough won the Westborough Community Land Trust 2009 Earth Day Essay Contest, and as a result, she was awarded the Westborough Community Land Trust 2009 Scholarship at graduation on June 6. 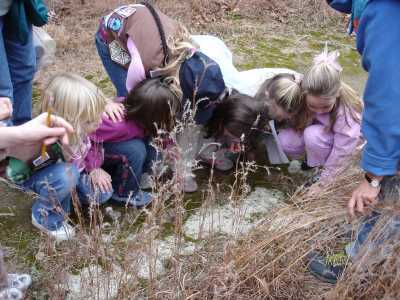 More than 40 hikers learned about signs of spring from Botanist Scott Shumway during the Nature in Winter walk. 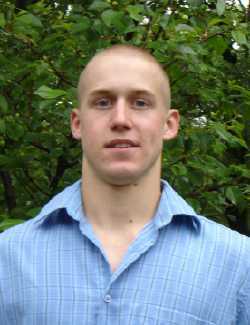 Westborough High School graduating senior Evan Gross received the 2008 Westborough Community Land Trust Scholarship. 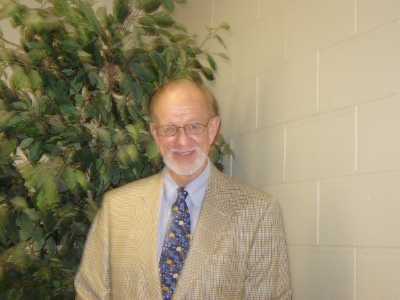 It was awarded on the basis of the essay he submitted in WCLT’s 2008 Earth Day Essay Contest. The WCLT scholarship is awarded each year to a graduating senior to recognize a deep appreciation and concern for the natural environment, as expressed in an Earth Day essay. 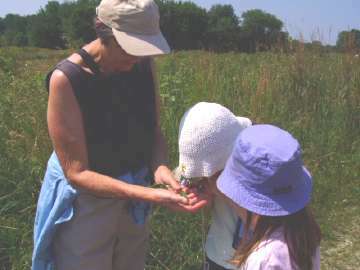 WCLT encourages young people to develop a strong connection with nature as the basis for responsible, thoughtful decisions about the environment. 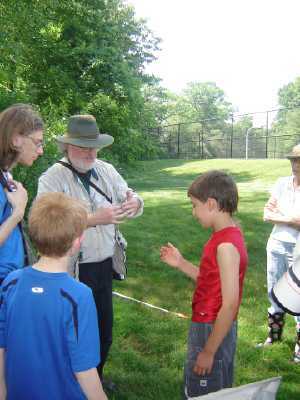 Earle Baldwin of the Athol Bird and Nature Club teaches WCLT families how to handle and release a dragonfly during the dragonfly and damselfy identification program at Rogers Field. 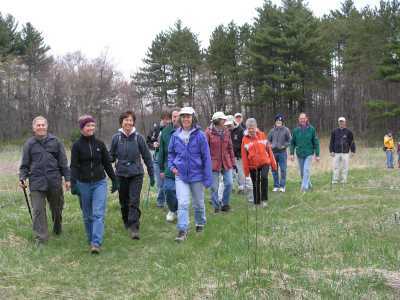 Led by Don Burn of the Westborough Community Land Trust (WCLT), a 2008 National Trails Day hike followed a 7-mile route along Charm Bracelet trails on Saturday, June 7. 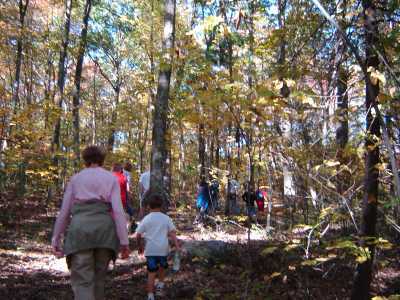 The hike was co-sponsored by WCLT and the Sudbury Valley Trustees (SVT). 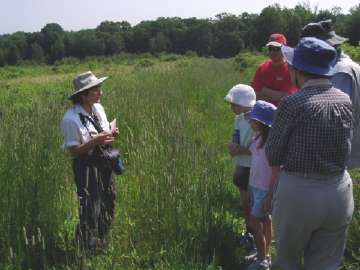 About 20 hikers set off in heat wave conditions and walked through lush sunny fields and cool green woods across the north side of Westborough. They crossed only one paved road in the 7 miles between the Mass Fish and Wildlife headquarters (off Rt. 135) and SVT’s Sawink Farm (off Walker Street). At one place, the trail avoids Lyman Street by passing under it via an old cow underpass once used by local farmers for their livestock. Westborough’s Charm Bracelet trail system is now three-quarters complete, with 21 of its planned 28 miles of main trails built, according to Don Burn, who chairs WCLT’s stewardship committee. The Charm Bracelet trail system will make a grand loop around Westborough, connecting parks, open space, neighborhoods, and recreation areas. In addition to the main Charm Bracelet trails, Don notes that 24 miles of side trails have been completed in town. Altogether, 45 miles of trails – 21 miles of Charm Bracelet trails plus 24 miles of side trails – are done, out of a total of 70 to 80 miles of trail that are planned. That’s a lot of family-friendly trails to explore right here in town. 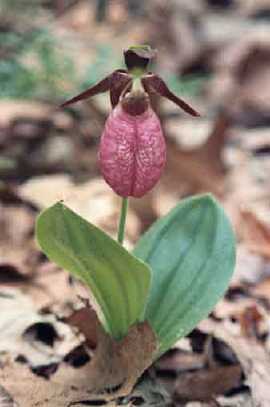 Annie Reid and Gary Kessler, of the WCLT “Nature Notes” in the Westborough News, led a wildflower walk for the Westborough Garden Club and WCLT to see May wildflowers, including pink lady’s-slippers in bloom at Bowman Conservation Area. 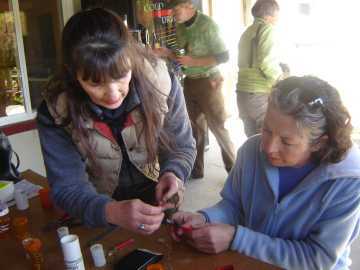 Susan Barnhart learns the techniques of bird banding from Helen Blazis of the Auburn Bird Banding Program led by Master Bander and Research Station Director Mark Blazis. Each spring and fall the team catches neotropic migratory birds in a mist net, then examines and bands them to collect valuable data on the birds’ health, population trends, and migration. 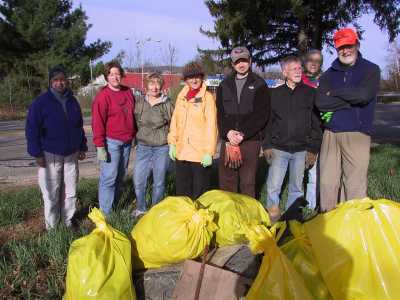 Spirited neighborhood and WCLT volunteers, as well as individuals, businesses and church groups, collected more than 40 bags of debris from Westborough streets and parks during the 2008 WCLT Town-wide Spring Clean-up, coordinated by Bruce Tretter. This year the public was invited to identify areas that needed the greatest attention. 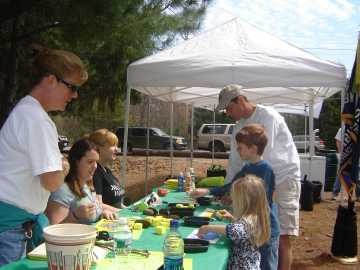 WCLT sponsored a Nature Crafts Table, coordinated by Susan Bush (l) at Westborough's Spring Festival Fishing Festival. 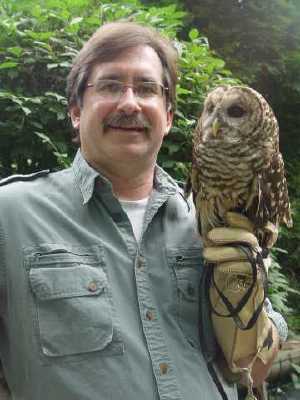 More than 100 people attend the live birds of prey program by raptor expert and environmental educator Larry Keating from Rulers of the Wind, He reported on the birds' struggle to survive as habitats disappears and praised WCLT's efforts to preserve open space. This was a special Earth Day event sponsored by a Westborough Cultural Council grant to WCLT. The Westborough Community Land Trust (WCLT) has selected Waterman Design Associates, Inc. as the first recipient of the WCLT Community Service Award. This new Community Service Award recognizes a local business that has done outstanding work to advance the WCLT mission of land protection and stewardship. James (Randy) Waterman, president of Waterman Design Associates, Inc., accepted the award for the company and credited Brian Waterman and Tom Converse of Waterman Design for the contribution to WCLT. Waterman Design Associates, Inc., located in the restored railroad station at 31 East Main Street, contributed its expertise to develop a landscape plan to restore the Gilmore Pond property into a woodland park. 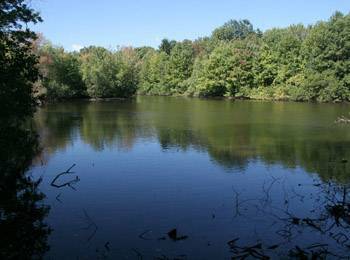 Gilmore Pond is one of the jewels of the 128 acres protected and maintained by the Westborough Community Land Trust. It contains scenic views of the farm pond created by Richard Gilmore for use in his apple orchard on Adams Road. 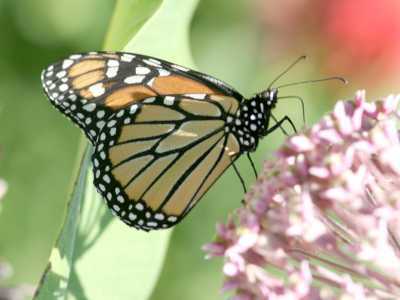 The landscape plan created by Waterman Design includes pond vistas, natural landscaping, bench locations, and a butterfly garden. 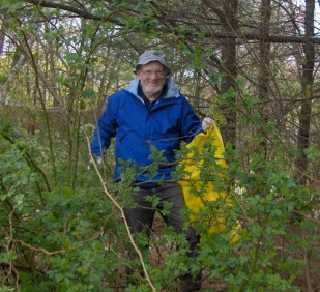 As a first step, the Westborough Civic Club and local Boy Scouts have joined the Land Trust volunteers in work to clear the property of invasive alien shrubs. First Prize, Robin Fleming for “After the Storm” taken in Uhlman’s Onion Patch, East Main Street. Striking images of Westborough’s natural beauty-- from the minute dew caught on cobwebs to a majestic sunrise over Mill Pond—capture the treasures found in the Town’s forests, meadows, and lakes. These images were on display in the Westborough Community Land Trust’s Photography Exhibition, “Westborough’s Natural Treasures,” from November 11 – 17. This free exhibit was open to the public. A newly opened view across Gilmore Pond hints of fall colors beginning to show through green foliage. In late September, this year’s fourth major volunteer work party at Gilmore Pond continued to tackle the big job of removing the invasive Asian honeysuckle shrubs surrounding Gilmore Pond. 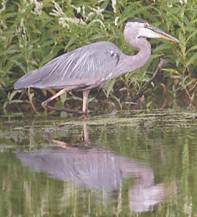 Thanks to their hard work, volunteers began to glimpse views of the pond from the trail and to see the sort of scenic landscape that they are making available to Westborough residents. About 40 people turned out for this work party, including volunteers from the Civic Club, WCLT, and Boy Scout Troops 4 and 100. 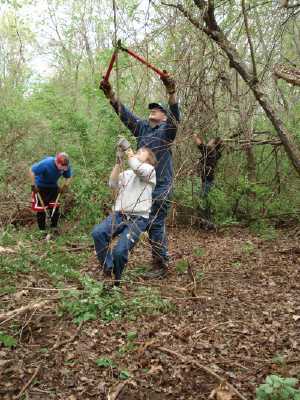 Armed with loppers and gloves, most volunteers focused on learning to identify the unwanted invasives, cutting them down, and hauling brush. 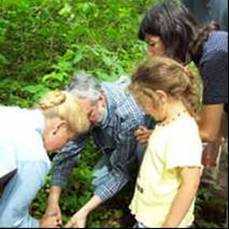 In the future, work parties will also target areas containing invasive oriental bittersweet and multiflora rose. 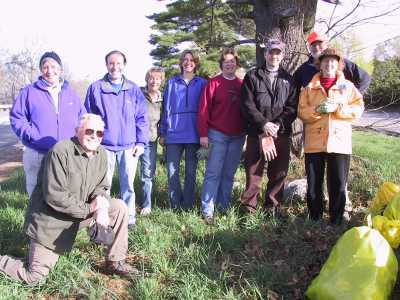 WCLT and the Westborough Civic Club are jointly sponsoring the multi-year Gilmore Pond Restoration project. Earlier major work parties were held in February, May, and July. Wheaton College Biology Professor Scott Shumway led a flotilla of ten canoes and kayaks with 18 adults and children on a "Nature Walk on Water" on Mill Pond on September 9. 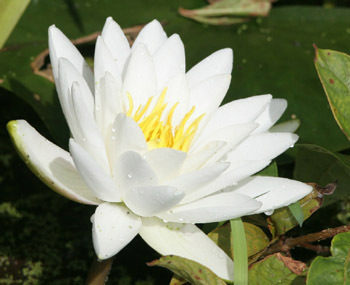 Professor Shumway pointed out and provided fascinating background on native pickerel weed, waterlilies (white waterlily, spatter dock, and water shield), non-native weeds (Eurasian watermilfoil) and sunfish and bass. The paddlers also enjoyed watching a kingfisher and a pair of mute swans, as well as a green heron in flight. 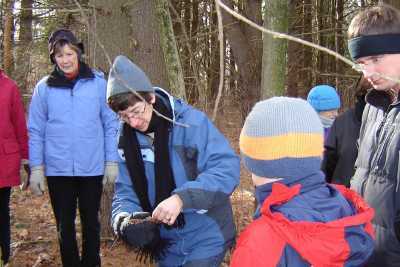 This adventure was part of Westborough Community Land Trust's Walks and Talks Program to highlight the natural treasures of Westborough and the importance of preserving them. 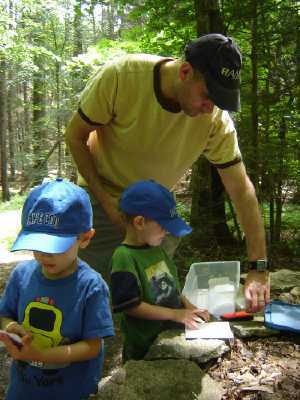 Twins Adam and Jack Wilan discovered nature stamps to add to their "passports" along the trail at WCLT's Naturethon. WCLT volunteers Susie Wells and Scott Henderson admire nature passports that children made during the Naturethon. Keynote speaker Wes Wade, Director of Land Conservation of the Trustees of Reservations. spoke about the importance of conserving land and its significance to global climate change at the WCLT 10th Anniversary Annual Meeting. 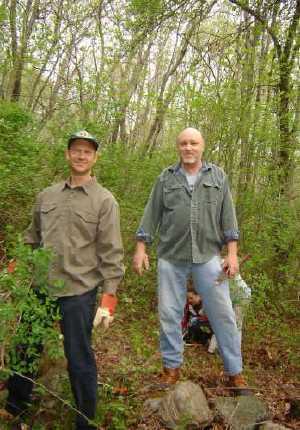 Civic Club members Wayne Saari and Mike Meachen at Gilmore Pond work party. The Civic Club with Boy Scout Troop 4 joined a major work party to clear invasive alien plants, particularly Asian honeysuckle, from the Gilmore Pond open space. WCLT, in cooperation with Westborough's DPW, coordinated a Storm Drain marking project to alert the public that any waste poured into street storm drains flows directly into water bodies without being treated. As part of the Town's Spring Festival, WCLT coordinated a "Learn to Fish" Clinic and hosted an activity table with a "plant a seed" theme. 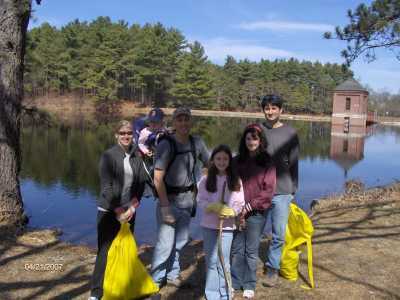 Kristin Rosenshine, Brooke Rosenshine, Andrew Rosenshine, Emma Piscia, Rebecca Piscia, David Piscia clean up Sandra Pond at Minute Man Park. 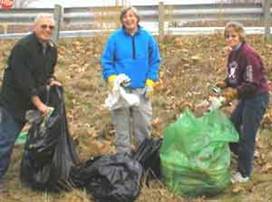 More than 60 volunteers participated in the Town-wide litter clean-up of public recreation areas and adjacent streets, including many families with children, members of local Boy Scouts, Democratic and Republican Town Committees, and the Good Shepherd Lutheran Confirmation Class. At the WCLT Annual Meeting, the 2006 Jack and Ellie Pepper Award was presented to Kim Simpson. This Pepper Award recognizes an individual in the community who has done outstanding work in land conservation and preservation and advances the WCLT mission. At the WCLT Annual Meeting, the Young Environmental Leader Award was presented to Zach Arnold for his enthusiasm, initiative, and dedication to improving the town’s environment. WCLT's Young Environmental Leader Award is given periodically to a young person in Westborough who has demonstrated an outstanding commitment and public service to the environment. 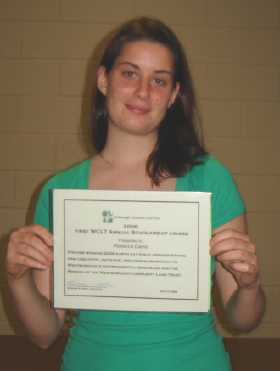 The first $500 WCLT Scholarship was awarded to graduating senior Rebecca Danis, who wrote about the problems of invasive bittersweet along local roads. Ben Gitkind received Honorable Mention for his essay on air quality and the burning of fossil fuels. About 30 people walked from Sawink to Cedar Hill and back. Due to the construction of the MWRA Walnut Hill Water Treatment Plant, the trail connection from Sawink to Cedar Hill had been closed for several years. 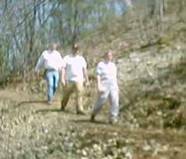 The MWRA has re-established this link with a new and improved trail. 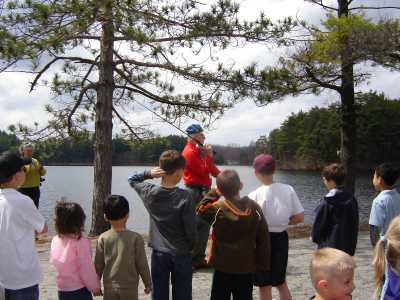 On Earth Day, there were two hikes: a five-mile figure-eight loop from Sawink Farm in Westborough to Cedar Hill in Northborough and back again, and a 2 1/2 mile hike from Scholastic Book Fair in Northborough. About 30 people did each hike. Residents of all ages joined the annual WCLT efforts to make our shared open spaces more beautiful by picking up litter at local parks and recreation areas. 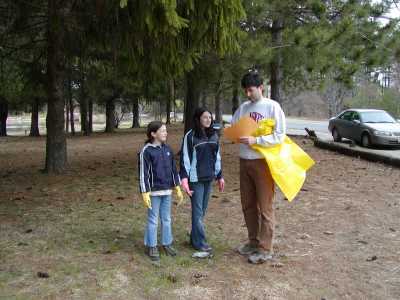 Dave Piscia, with daughters Emma and Rebecca, were part of the WCLT crew cleaning up around Sandra Pond Reservoir. 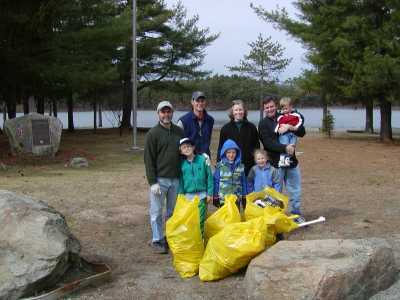 Helping to clean up the Upton Road ballfields and Sandra Pond Reservoir were (l-r, back row) Ken Sciarappa, Scott Henderson,Pauline Sciarappa, Ian Johnson with son Liam; (l-r, front row) Luke Sciarappa, Miles Henderson, and Corinne Sciarappa. 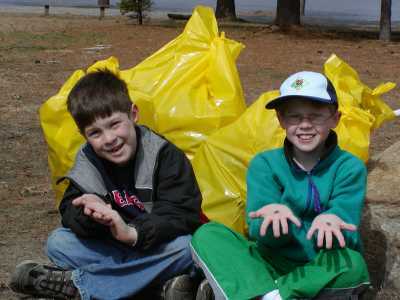 Jimmy Rogers, age 8, (left) Luke Sciarappa, age 9, (right) of Cub Scout Pack 33, joined the litter clean up at Minute Man Park as part of their community cleanup requirement for their "Leave No Trace" Awareness Award. 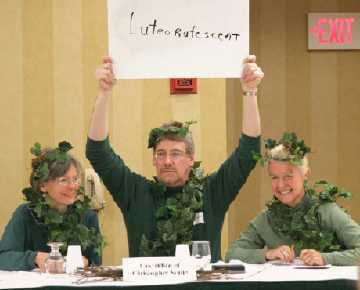 The WCLT Tree Huggers (l-r Annie Reid, George Barrette, and Kris Allen), sponsored by Attorney Christopher Senie, competed valiantly in the 6th annual town-wide Westborough Education Foundation Spelling Bee on March 6, 2006. 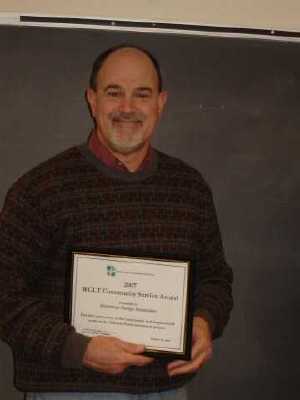 At the winter 2006 Board Meeting the WCLT President's Award was presented to long-time Stewardship volunteer and original WCLT incorporator Al Sanborn, for his outstanding service to the Westborough Community Land Trust. Don Burn, chair of the Stewardship Committee, said, " Over the last seven years, Al has been involved with WCLT in building all of the 20 miles or so of trails in town. He is the one we rely on to be our 'rapid response' guy. 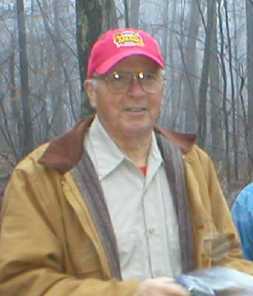 When we need someone out on the trails in a hurry, Al is the first to answer the call...The WCLT Stewardship Committee can always depend on Al to step up and do the routine but critical maintenance to ensure that trails are open for people to enjoy. Al has a great positive, can-do attitude and is a totally reliable, invaluable volunteer for the Westborough Community Land Trust." 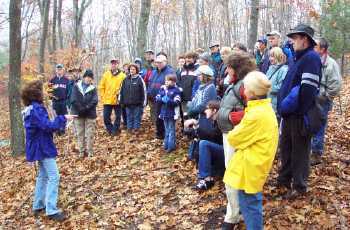 On Sunday, November 6, 2005, WCLT, co-sponsored with Westborough Historical Commission, held an archaeology walk in Cedar Swamp. Westborough was the site of Native American hunting, fishing, and stone tool making dating back more than 8,000 years. 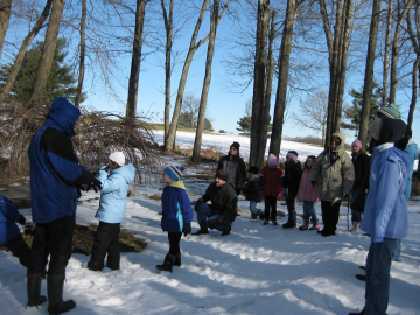 Families came to visit some of the sites and learned the lifeways of Native Americans in Westborough with local archaeologist, Michelle Gross. 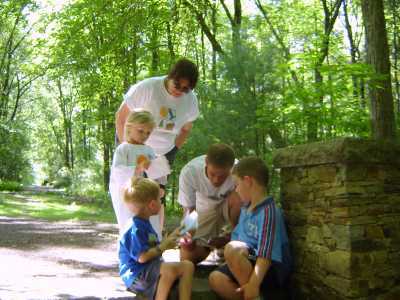 WCLT celebrated the National Trails Day weekend with two walks and the first Charm Bracelet Hike. 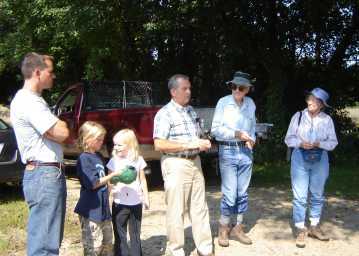 On Saturday June 5th the trust held a morning walk from the Gibbons School with a discussion of invasive plants. 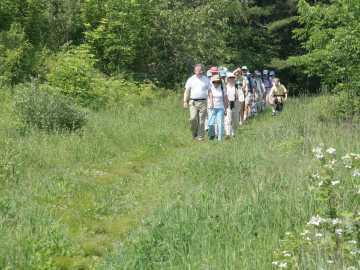 That afternoon a second walk was held in Bowman Conservation area with a demonstration of trail maintaince. On Sunday June 6th sixteen dedicated hikers started from Minuteman Park and worked their way across town to the Grafton town line and then up to the MBTA train station on Smith Valve Parkway. This celebrated an essentially complete ten mile segment of trail. 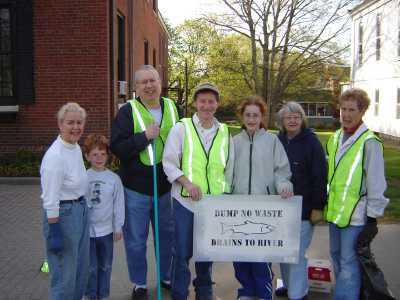 WCLT celebrated Earth Day weekend several cleanup efforts. Crews collected trash at several locations around town for eventual pickup by the DPW. WCLT also built a trail on Earth Day along Mill Road to eliminate a dangerous walk on the side of the road. The trust thanks the Westborough Country Club Committee for giving us authorization for the trail on their property.